Herrick Reservoir is a smallish man-made lake in the north end of the Round Valley area of Idaho. Some locals refer to it as Skunk Lake - and we could see why as we saw two skunks there one evening. 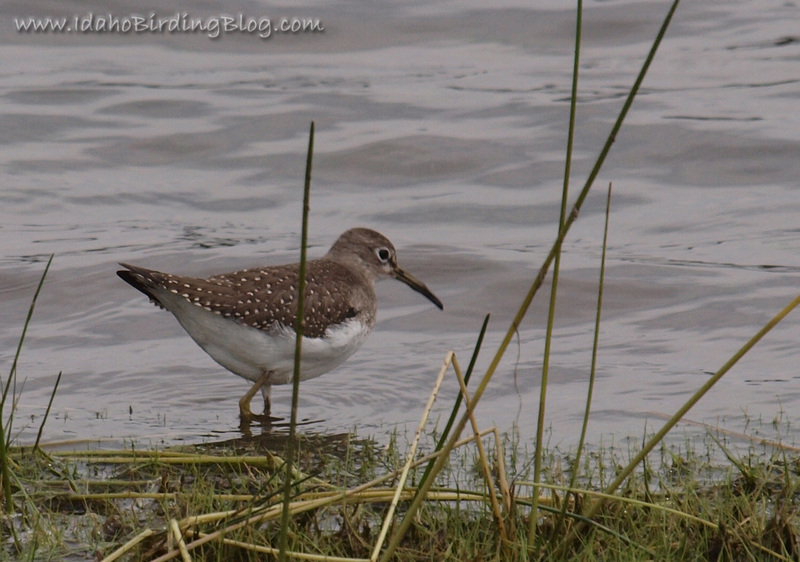 The highlight of the two visits we made to this reservoir had to be three not-so-solitary Solitary Sandpipers. Several Osprey hunted over the waters and I watched one snag a fish. A Double-crested Cormorant perched on an old pine snag out on the water. Killdeer and Least Sandpipers cruised the shoreline. A flock of non-breeding plumage Ruddy Ducks and Common Mergansers rafted around the lake. This is another under-birded location in Idaho with loads of potential. The roads into Herrick Reservoir are pretty rutted out. Four-wheel drive vehicles can make it without any problem, but the family minivan would not. Our girls had fun running up and down the sides of the ruts. My son Kyle landing his first Rainbow Trout. It was also the largest fish he's caught to date. The look on his face is saying "Okay Dad...I just caught this fish...Now what am I going to do? I ain't gonna touch it!" The fishing there was pretty good as I observed several dozen trout being caught. My youngest Claire cried herself to sleep in my arms after accidentally slipping into the water. I had to set her down to clean Kyle's fish and she looked so cute on the bank that I had to snap this shot. It looks like a great spot for a day out with the family and a chance to introduce the kids to the joys of birdwatching.